Paul Finebaum welcomed ESPN radio personality and rat-faced gasbag Colin Cowherd onto his radio show yesterday, and the two did some chatting about Auburn's stunning win over Alabama in the Iron Bowl. 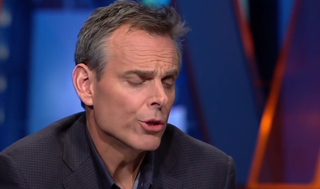 Cowherd apparently had some not-nice things to say about Alabama during his segment. Big mistake, Colin! Right after Cowherd hung up, Alabama fan Phyllis called into the show, and she unleashed a great school-yard put down. Colin Cowherd? More like Colin Cow-Turd! If you gon' tell the truth, you gotta tell the truth. Never forget that, Cow-Turd.